Complete Protection for Databases, Files, Applications, Operating Systems, and Physical or Virtual Servers. FalconStor Continuous Data Protection (CDP) technology has reinvented data backup and recovery. Complete Protection for Files, Applications, Databases, Operating Systems, and Physical or Virtual Servers. We have progressed far beyond the unreliable daily tape backups, FalconStor CDP has combined local and remote protection in one cost-effective, unified, disk-based solution providing the ability to recover data back to the most recent transaction. The Recovery Point Objective (RPO) shrinks to mere seconds. 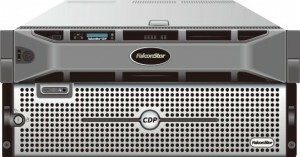 FalconStor CDP supports expanding data volumes, LUN size support of up to 64TB. Advanced multi-threaded architecture allows simultaneous computing operations (replication, compression, encryption) for the highest replication speed. Patented MicroScan™ technology minimizes the amount of data transmitted by eliminating redundancy at the application and file system layers. MicroScan technology maps, identifies, and transmits only unique disk drive sectors, reducing network traffic and bandwidth requirements by as much as 90%. Reduce recovery time objective (RTO) from hours to only minutes. FalconStor CDP provides enterprise-class functionality to organizations of all sizes, from small-to-medium (SMB) and remote/branch office (ROBO) environments to large enterprise organizations. It is available in the form of enterprise-level software, storage appliances, gateway appliances, and small-footprint virtual appliances for VMware environments. FalconStor CDP Gateway Appliances: integrate with the existing third-party storage of midmarket and enterprise organizations. FalconStor CDP VS Series Appliances: high availability appliances for heterogeneous enterprise environments.